Downwind Sailing with a Parachute, $350.00 as long as they last. Someone once said ‘Sailing is like standing in a shower while throwing 100 dollar bills over your shoulder’. I think whoever came up with this definition for sailing had just completed a downwind sailing passage. Wind is directly from the aft and is below 10 knots. You have you main and headsail up. There is a swell from the side. Everything is rolling including the lunch you just ate. Crew must hold onto anything permanent they can find on deck to stop from sliding overboard. Your heart just about pops out of your chest every time the boom and all the running gear crash from side to side. The headsail collapses and fills with such force that the whole boat shakes. With every bang, crash and vibration of your yacht as you sail downwind you can feel every dollar just floating away. Or maybe you have your spinnaker up. Mostly you need two people for this sail. Depending on what type of spinnaker it is you will need a pole. Unless you are constantly watching this sail and monitoring the strength of the wind this is one sail that can get out of control and end up a tattered mess on your foredeck. If crew can’t get it on deck fast enough it can end up in the water whereupon the boat sails over it. Ahh, what a mess. No wonder a lot of sailors leave their spinnaker in the forward lazorate just so they can say that they have one but in fact it has not seen the light of day since the boat was purchased. And then there is the two headsail combination. This is not a bad option. Have one headsail on the roller furled and the other headsail free standing. You don’t have the banging effect anymore but it doesn’t stop the rolling of the boat. Or like a lot of sailors in order to relieve all the stress and tension on the boat and their hearts there is motoring. But in today’s world this is not a cheap option. And anyway aren’t we supposed to be sailors! Downwind sailing can bring your dreams back to reality with every bang of the boom to such an extent that you feel like putting your boat up for sale in the next port. Why do you think there are so many boats for sail in the Caribbean? Downwind sailing can be very tricky. The reason been most yachts are just not set up for this type of sailing. Today yachts are so top heavy with all the latest equipment on board radar, solar panels, wind generator and in light winds this doesn’t help your downwind sailing experience. So what if I told you I had the perfect solution to all your downwind sailing frustrations. A Modified Round Parachute. Not just any round parachute. A parachute that you jump out of a plane with. Flying a round parachute as your downwind sail of choice was first tested crossing the Atlantic Ocean back in the year 2000. It was the brainchild of my husband Peter. After hearing all the stories from previous cruisers who had crossed the Atlantic with the large waves and wind from the back he swore there had to be a better solution. And he found it in the form of a modified round parachute which he flew the whole way across the Atlantic without once taking it down. After getting his hands on a couple of different sized parachutes he found the parachute that was the right size for our 11m wooden yacht ‘Petima’. Our parachute has an 28 foot diameter and would be suitable for yachts between 10 to 13m. You can fly the parachute between 130 and 180 degrees and between wind speeds of 5 to 35 knots. 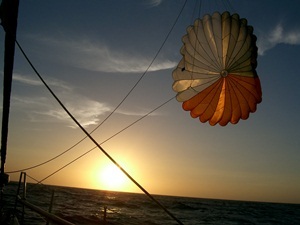 The parachute flies in front of the boat approximately 10 meters in front. It is attached to the spinnaker halyard at the top and another sheet from the bow. The round parachute moves around but it does not oscillate. A 28 foot round parachute has 28 lines around the cap. These 28 lines give the parachute its shape and strength. By splitting those 28 lines into two lots of 14 you get two holding points. The beauty of this configuration is that the parachute pulls your boat and doesn’t push it like a spinnaker. If you are in big waves you will ride the wave and your bow will not dig into the wave as the parachute lifts up the bow. You will never be out of control flying a parachute. It is perfect for cruisers on a long downwind sailing passage with a small crew. You don’t need an autopilot just adjust your rudder in the direction you want to go and it will pull you along on this course. So no strain on the autopilot or drain on your batteries which is a regular occurrence in downwind sailing. If you have solar panels you will find that the solar panels are not in the shade of your sails so you get more power into your batteries. Most importantly the rolling motion of your boat, which can make most grown men cry with frustration will stop immediately as the parachute stabilizes your boat. You will find no other sail that gives you so much comfort by downwind sailing on a yacht. The trick with flying this sail is to make sure that none of the lines get tangled. There are 28 lines on our parachute, 18 lines to the top and 14 lines to the bottom of the sail. When we bring the sail in we always tie the two sets of 14 lines separately and make it ready for when we want to launch it again. This makes your job of setting the parachute very easy. You also want to set your parachute so it doesn’t get tangled with anything on deck. We normally set our round parachute over the side of the boat and then set up the parachute and our course once it is launched. As for taking the parachute down, this is the part that most people dread when it comes to flying their spinnaker downwind. There are a couple of ways you can get your parachute down. We use our genoa. By rolling out our genoa the parachute comes in the lee of the sail and you can easily pull it in on deck. Flying the parachute has been tested on both catamarans and mono hulls. Speaking to cruisers about our experiences with flying a modified round parachute they are naturally very curious and interested. Most are so frustrated with downwind sailing that they want to give it a try. Anything to stop the rolling and banging. When they try it themselves they just can’t believe it. They could never have believed that downwind sailing could be so easy and safe. We can still see our friends Margret and Henning Kruithoff standing on the foredeck of their catamaran shaking their heads in sheer disbelieve as they sail alongside us with their newly acquired sail. ‘Diatethyl’ an 11m German catamaran sailed parallel to Petima from Brisbane to Cairns as Peter explained to them how to rig their new parachute over the VHF. They found it so easy to set and more importantly bring back down and have raved about downwind sailing every since. Other friends of ours on Canadian yacht ‘SDF’ sailed for 13 days consecutively from the Galapagos Islands to the Marquesas Islands in French Polynesia with their round parachute set day and night. Skipper Jean Marie mentioned ‘we didn’t have to adjust the sail once in the trade winds. Wind was a constant 15-20knots with occasional squalls reaching 30knots and the parachute handled it beautifully. It was dream sailing’.